Here's Goggle V's last ten episodes as I promised. We have episodes 41 to 45 which are still regular episodes. Episodes 46 up to 50 will deal with the five part finale arc which shows the beginnings of Hirohisa Soda. Sometimes, I just forget how Goggle V is a very old series and that it's pretty much an experimentation to how the legendary Hirohisa Soda would carry out his later science fiction heavy works with Bioman, Changeman, Flashman and Liveman. 41 -- With great power comes great responsibility, right? Deathdark is creating a new super suit with the help of Silkworm Mozoo. This super suit looks super GOOFY but it grants such power. They intend to create a super army. Unfortunately, the operation goes goofy when a civilian gets his hands on the suit and becomes an instant superhero. This one has me remembering the lines that Wolverine once said in X-Men Evolution when he said, "Greatness isn't supposed to come that easy." Boy, does this episode remind me of that! He becomes an instant superhero but he also becomes Deathdark's latest targets. The Goggle V manage to show that it's not their suits but who they are that makes them heroes. They aren't thinking about publicity but others. The instant hero learns his lesson and returns back to becoming a normal guy. 42 -- Childhood friends and hurts is what this episode is about. Kanpei's friend Sayaka (and possible love interest) is a pre-school teacher. She gets caught by Deathdark as they plan turn the Goggle V into scorpion mutants for their scheme. They go as far as to even kidnap helpless children and use them as hostages. 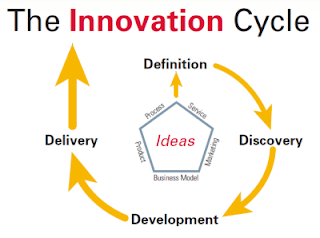 What do you expect from a group that doesn't value life as they pursue innovation? Kanpei gets stung and he's nearly turned into a mutant. He gets a knife and intentionally wounds himself to avoid the venom from spreading. Ouch! Kanpei's lady friend Sayaka does what she does to save the children -- all in the name of valuing life. I love how it ended with the children being saved at the end. 43 -- Deathdark uses Earthworm Mozoo in hopes of finding some secret gold coins. This episode shows us how wealth can be misused and abused. Deathdark wants to use the gold coins to finance whatever half-brained scientific experiments they're after. The sideplot involves a grandfather and his grandson (again). Somehow, I like grandparent and grandchild relationships in shows especially when I grew up close with my grandparents. Deathgiller also shows his stupidity yet again. He should have finished off the Goggle V rather than let Mazurka torture them via electric shocks in the net. The Goggle V do manage to get the treasure before Deathdark does. The finders of the treasure decide to spend the gold to help develop their village rather than for selfish purposes. 44 -- Another episode where you are taught to cherish your food. I don't know which is more meaningful than the escargot episode in Battle Fever J or previous episodes such as don't waste your food or cherish the fish. Deathdark launches its latest half-brained plan by scattering evil sand on everyone. Get touched by Condor Mozoo's evil sand AND you are bound not to eat or drink. Every food you touch and water you touch turns into sand. This doesn't sit well with Futoshi as he's a huge eater. He gets so starved that he can't fight. Mazurka tries to use his gluttony against him which is clever. Condor Mozoo's sand isn't magical. It only works when he activates the switch. 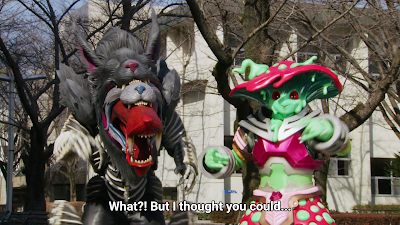 It also involves a fake betrayal plot where Goggle Red supposedly "dies" and it turns out that it was all a trick. However, I think Futoshi should seriously trim down on the calories. 45 -- Tanuki, tanuki -- aren't we watching too much Manga? I'm just reminded of that Tanuki suit in Super Mario Bros. 3 where Mario can disguise himself as a statue. This episode has Tanuki Mozoo who can disguise himself and show confusion. It's almost like Mystique in X-Men who made her debut in a Miss Marvel Comic which was so last 1978. I like how the Goggle V really practice their ability to discern the trickery. The comedy comes when he tries to imitate Goggle Black and Goggle Pink. It doesn't matter how much he tries to imitate them but the real Goggle V are the Goggle V. It's almost also a lesson on individual uniqueness -- there's only one of you out there! I guess Tanuki Mozoo learned it the hard way. Sidenote, it's also the first episode to feature the idea of an evil Super Sentai via the short-lived Deathdark Five. 46 -- The plan to build a futuristic city for the 21st century is here. Kenichi's friend is out there searching for a suitable location only to be attacked by Skunk Mozoo. I think a skunk monster would work wonders especially you don't want to be near one. Getting peed on by one can be highly infectious. You don't want it to fart on you. This skunk releases hallucinations too. 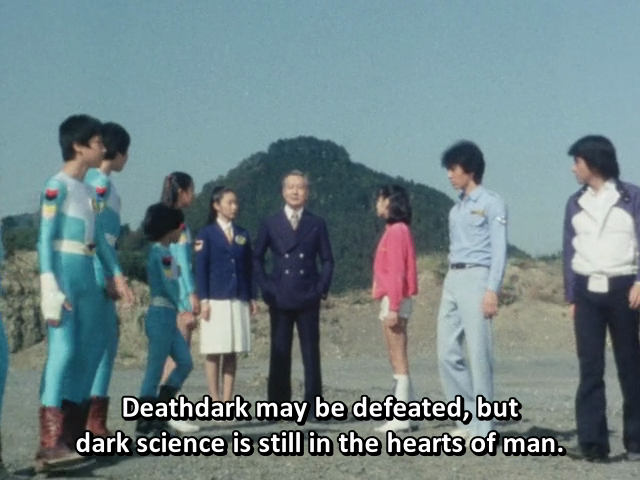 This episode also starts the finale arc when Deathdark discovers the Hightron energy. Kenichi losing his friend Toyama is also traumatic. Deathdark has huge plans for the Hightron Energy which they could use to conquer the world once and for all. It's really a frightening thing when something that could be used for good is at the hands of evil! 47 -- Deathdark finally begins the construction of a new weapon called the Dark Hole. This would start wiping out all organic matter so Deathdark can recreate the Earth from scratch. Ouch! I can't imagine how the Earth would look like if they succeeded. They also discover how the Hightron energy can allow them to teleport great distances but it doesn't work on Tortoise Mozoo. The weapon itself requires time to build. Deathdark can't dilly dally in their plans. I love how Tortoise Mozoo ends up in a misadventure when he lands over the wrong spot. The Goggle V also dispense whatever last energy they have to break the Hightron barrier. I just thought that I might have turned Tortoise Mozoo into a bomb instead. 48 -- Probably a do or die mission isn't it? Mazurka herself is tasked with locating the Goggle V's base. Deathmark showers her with Hightron energy which will allow her to turn invisible at will. They want to go to the Goggle V headquarters and DESTROY IT. The plan works like a charm and Mazurka manages to ride the Goggle Cougar and into the base. She enters there yet nobody can see her while she's weakening at the same time. The plan brilliantly uses Cheetah Mozoo as a distraction. Finding the Goggle Base wasn't easy and now it's there. I suspect that Mazurka was set up as a bomb for this reason -- remember the episode when she and her group failed to hunt it down? Perhaps it was a punishment for failure. I just find it too cruel that Deathgiller will suddenly just ditch someone he's been partnering with almost every mission just like that. Mazurka goes insane and tries to take everyone down with her. I even felt sorry for her even when she's a villain. This was somewhat repeated in Changeman's episode when Queen Ahames finally snaps and decides to destroy the Changeman's secret base. IMHO, I wish this one starts with a scene with Fuehrer Taboo punishing Mazurka telling her to destroy the Goggle V or never return to Deathtopia. This would have been better when we have a where where Deathmark tells her that he can help her get redemption -- by giving her the Hitron energy, where she knows she must succeed or never return to Taboo's side. Yet, Taboo sent her on a do or die mission feeling that she's outlived her usefulness. 49 -- The second to the last episode features Deathgiller and a dilemma. The base is blown up and the Goggle V are defenseless. A wounded Deathgiller arrives. The others want to leave him but Kenichi plays Good Samaritan towards his rival. Sure, they are enemies in the battlefield but it's still wrong to leave your wounded enemy like that. Kenichi has his rival tended until he's well-enough. Meanwhile, Professor Hongo suddenly appears after SO MANY episodes of being missing since his departure in episode 2. Deathgiller shows he's obsessed about finishing the Goggle V. He foregoes the kindness that was shown to him and decides to tell Deathmark where the secret base is. IMHO, I think I would have wanted Deathgiller to die in a one-on-one confrontation with Goggle Red instead of dying in the mecha battle. Maybe, have him command Bear Mozoo. Have him and Goggle Red finally settle the score for good. Goggle Red would have ended up finishing off Deathgiller in a deathmatch. Instead, Deathgiller decides to pilot Bear Kong to finish off the score where he was defeated for good. This also shows how Goggle Red has his sense of honor by not finishing off helpless enemies and ending the feud in the battlefield. 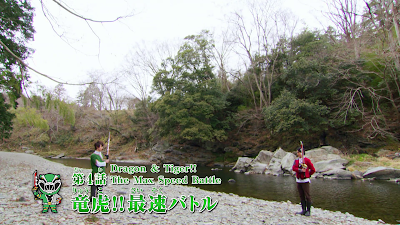 Granted, Soda didn't have any death duel between a red ranger and enemy until Changeman so I guess that's that. What I think could have been done is when Deathgiller's previous failure lead to his banishment from Deathtopia. He's told by Fuehrer Taboo to destroy the Goggle V or never return. To do so, he reveals their hideout and promises to destroy the Goggle V team and swears his life on it. He challenges Goggle V to a final battle where he would either win or if he dies, at least he dies in battle rather than to return disgraced to Fuehrer Taboo. 50 -- The final episode and still pretty basic given that it's Hirohisa Soda's first series. The Goggle V team finally face off with Deathdark once and for all. Deathmark shows up and introduces himself in person with the hopes he can finish off the Goggle V team. The Goggle V team faces off against Deathdark's power. What makes me WTF is that why didn't Deathdark think of finally intervening in missions earlier? He was almost just an accessory and rarely came up with a good plan. Most of the time, he was just simply there to supervise or assist Fuehrer Taboo as an adviser-type villain! The Goggle V manage to create a trap by using an empty Goggle Caesar and invade Deathtopia. This is where Goggle Red comes face to face against Deathmark. Deathmark sure does lack common sense. He could have executed some powerful attack or whatever and KILL Goggle Red. But I guess he's too concerned about the safety of his master. Goggle Red meets eye-to-eye (literally) with Fuehrer Taboo and does a flying sword attack -- which was later repeated by Red Turbo challenging Ragorn. Fuehrer Taboo emerges as some moss-like organism ready to destroy everything. IMHO, I wish Fuehrer Taboo fires some dangerous bolts of energy at Deathmark issuing a final do or die mission -- destroy the Goggle V or never return to his side! Goggle V finish off Deathmark in a heavy battle. The handmaidens fall too easily while Deathmark puts on quite a fight. The Goggle Golden Spear finally destroys his sword -- which takes him along with it resulting to an epic explosion. Fuehrer Taboo finally emerges after the Goggle Caesar fires a missile to Deathtopia's open spot. The fight with Taboo was nothing spectacular. The way he's defeated almost mirrors the way Satan Egos was finally destroyed in Battle Fever J. When the Galactic Cut didn't help -- the Goggle V team use the Earth Sword as a missile to poke Taboo's eye. Yet there's one word of caution -- Deathdark may be gone and dark science is still around. Yes, that's the fight and we must be careful not to take innovation towards the wrong direction. This idea would later be explored in Dynaman and dwelt deeper in Bioman, Flashman, Liveman and well Megaranger would also get that treatment even if Hirohisa Soda wasn't a bit involved! I guess I won't make an outro of sort as the final episode serves as the outro. Hopefully, Millionfold Subs will complete the Dynaman series fan subs ASAP!